The official opening of Fablab.iMAL that took place on Friday 14th in the well-known Brussels-based Media Lab iMAL (Center for Digital Cultures and Technology) gave us the chance to look closer at personal fabrication and to observe curious artifacts. On the Brussels Maritime Canal banks, more precisely in Quai des Charbonnage/Koolmijnenkaai, one can find iMAL (Interactive Media Art Lab): a non-profit association engaging with new media art and offering space for contemporary art practices and artist residencies. Created in 1999, iMAL is not only an Art Center programming various exhibitions, performances and lectures but also a partner for research projects on art, science and industrial innovation. In collaboration with artists, iMAL organizes masterclasses and workshops as well. On top of that, this Media Lab has just opened up a fabulous laboratory equipped with state-of-the-art machine tools where anyone could go and fabricate (fab) something. Such a place is known as a Fab Lab, addressed not only to creative people – designers, architects, artists – but also to anyone who enjoy tinkering and want to make something just for the fun of it. Fab Labs or FABrication LABoratories, introduced as facilities where you can make (almost) anything, are these new trendy places that get a lot of coverage on the net these days. These laboratories are part of the very hip “do it yourself” (DIY), “do it together” (DIT) or “do it with other” (DIWO) concepts, shared among a community of hobbyists – a new class of geeks- called the makers. A Fab Lab is a small-scale laboratory for digital fabrication and rapid-prototyping that houses shared Computer Numerical Control (CNC) machine tools and 3D printers (desktop manufacturing). It was first launched in 2001 in MIT’s Center for Bits and Atoms (CBA) to investigate the following suit of digital revolution, in researching digital fabrication, with the goal to develop programmable molecular assemblers. Since then, a worldwide network of small-scale Fab Labs is growing rapidly both in remote areas and in big cities. 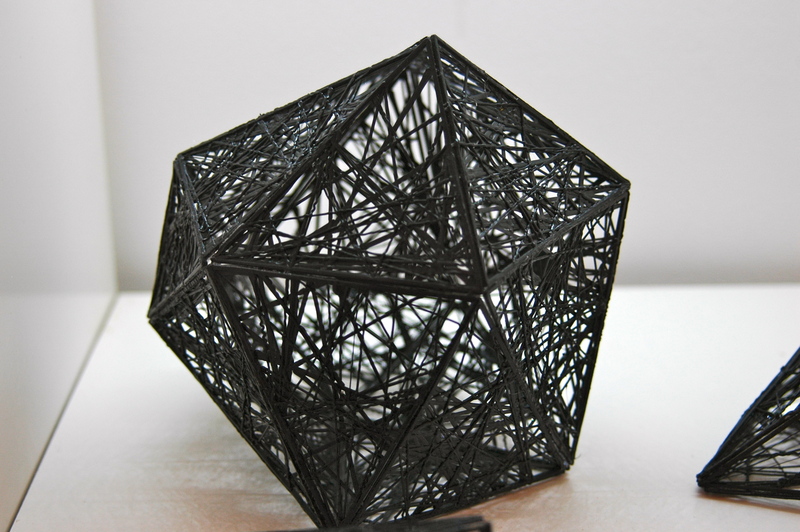 Digital fabrication – the use of computer-controlled tools in the making of physical objects – is usually based on two methods: CNC and solid free-form fabrication. 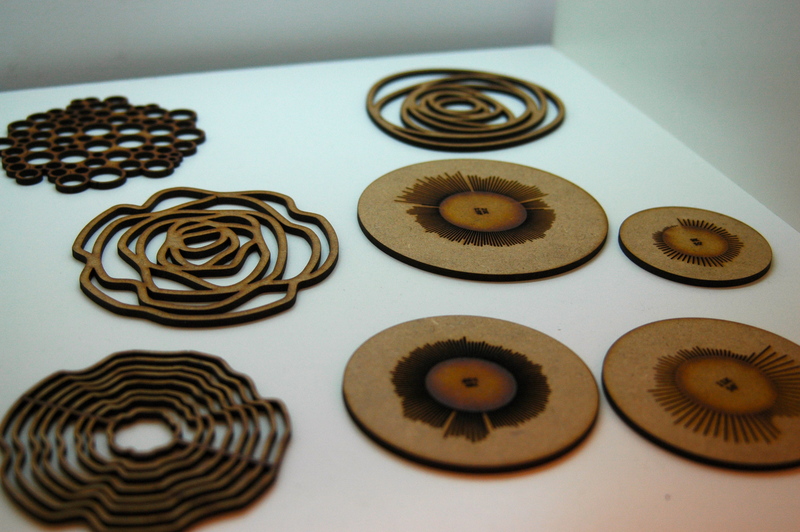 CNC cutting tools are vinyl cutters, laser cutters and CNC milling machines. Such technique is also called subtractive. Along with cutting tools, we have additive-fabrication technologies or solid-free fabrication, which is a way of building things without waste. 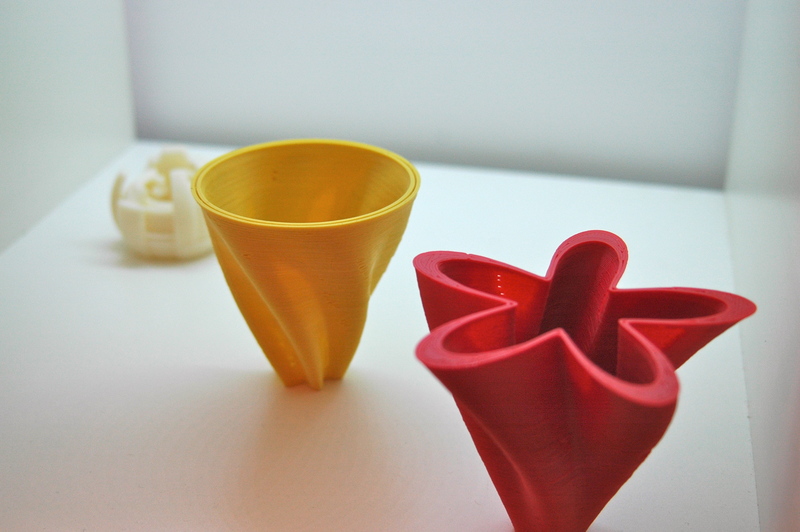 Rapid prototyping and manufacturing (RP&M) tools such as 3D printers have gained a lot of popularity these past few years: firstly, they can create three-dimensional objects by laying down successive layers of material, which is a very attractive methods. 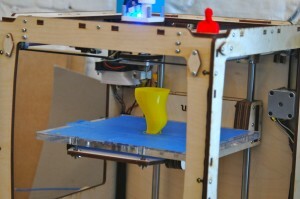 Secondly, a large and active open-source community has been promoting 3D printers by making them more accessible to individuals. They are cheaper, smaller and most importantly, opened (ReRap, MakerBot, Ultimaker, Fab@Home). Such technique enables individuals to process (assemble) atoms – as they already do with bits – to shape (almost) anything. This revolution in manufacturing, also described as the Next Industrial Revolution (Chris Anderson), is personal, which means that one can manufacture a product using a personal computer and a printer to produce three-dimensional solid objects. These technologies usually found in the industries become accessible – first via Fab Labs – to the masses in the form of personal fabricators. However, these printers are still limited to few choices of material and the real revolution to come would be the development of the Ultimate Personal Fabricator, similar to the Star Treck replicator that would copy all the molecules of any given object, and enable users to play with the physical world of atoms on their desktop. The process of fabbing an object emerged from the open source movement notably with the development of open source hardware and the raise of commons-based peer production. Linked to the counterculture and similar to hackerspaces or makerspaces, Fab Labs share core capabilities – specific tools that enable people to realize and share their projects – and core ideals such as open design, open access, mass customization, collaborative work,distributed creativity and sustainability to name a few. Fab Labs must be (partly) free and open to the public, subscribe to the Fab Charter and has its text on display on site and website. In return, participants are expected to share their design, contribute to documentation and instruction. Such obligations comply with commons-based peer production principles: learning from peers and sharing open source design. Fab Labs can be viewed as a disruptive technology, which aims at disturbing a traditional market structure and changing manufacturing. Israeli designer Ronen Kadushin who developed an open design method that enables users to download, copy and modify his products, argues in this sense. According to Kadushin, “a revolution in product development, production and distribution is imminent due to the Internet’s disruptive nature and the easy access to CNC machines”. Open design, based on open source software principles, is considered as an important and recent development in creative industry. Accelerated by digitization and digital communication, open design challenges not only the role of the designer itself but also today’s market-driven culture.Thanks to Internet technologies, individuals moved from being consumers to producers. At FabLab.iMAL participants can access to the means of production either through membership or residency. As members, individuals can use the facility during open days (Wednesday and Thursday evening) and must previously attend an introduction workshop to know how to use these machines. Afterwards, all they have to do is fab and document their work on the wikimal. 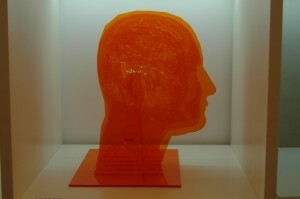 During the opening, numerous artifacts made (fabbed) by artists in residency were displayed in the lab. Here’s a selection of these projects realized in FabLab.iMAL. It offers a glimpse into practices ranging in the frontier of generative design and art and on the emergence of new hybrid industrial design/sculpture objects, as defined by Toronto-based designer and researcher Greg J. Smith. Political Profiles made by Frederik De Bleser (phd student at Sint Lucas Antwerpen) and Lieven Menschaert represents the inside of the heads of the political candidates in the 2012 American elections. Quotes of candidates, campaign contributions and regional popularity have been engraved (laser cut) to finally be superimposed in successive layers. 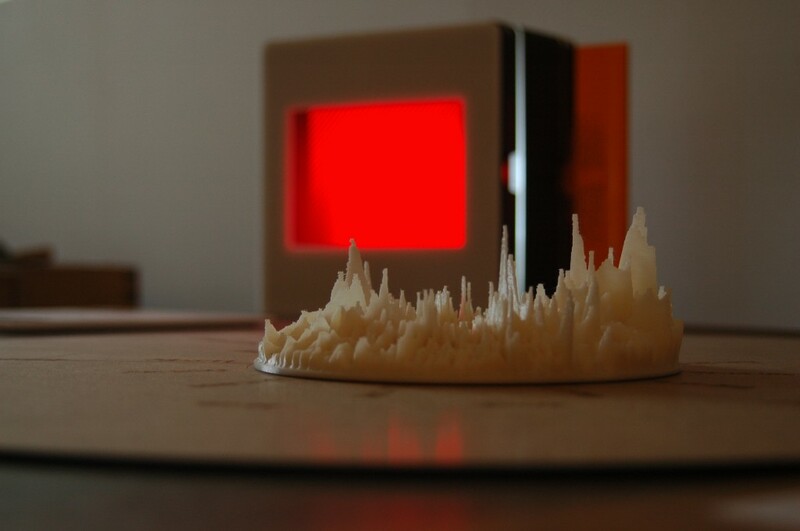 Corneel Cannaerts‘ Encoded Matter represents code translated into tangible objects. The concept of materiality is at the core of fab practices and various projects tend to bridge the gap between our digital world and our physical world. 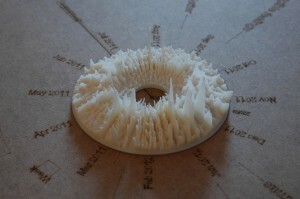 Google Eye (Andrej Boleslavský – Interaction designer and new media artist) is another example that aims to the persistence of materiality: a 3D printed sculpture representing Google Analytics data about visit of ciant.cz webpage (CIANT – International Centre for Art and New Technologies). The data represents one year cycle with events being visualised as a peaks of falls. 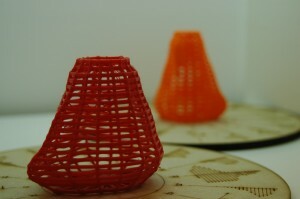 Jan Vantomme’s Beyond Resonance are 3D printed yellow and red objects. A Single Tear is an attempt to materialize (3D printing) the data of all causes of death in 2006 that were collected from the FPS Economy. The artist Frederik Vanhoutte wanted to explore the meaning of death in our society, stating that only statistics remain. The project of making an object out of such data is a way to reclaim some of the grief, writes Vanhoutte. Bert Balcaen & Ingrid Stojnic’s Runner’s Medal are laser cutting medals that contain data of time, distance and speed of a runner in order to create personalized medals. 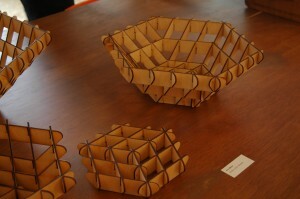 Belgian designer and architect Alex Welter has created basket kits (Redux Cubic Baskets) made with the laser cutter. This series available in all sizes (S, M, L, XL) is an example a press-fit construction, which is a way of building an object without the use of adhesives or fasteners. Building this kind of furniture seems as easy as assemble Lego parts. 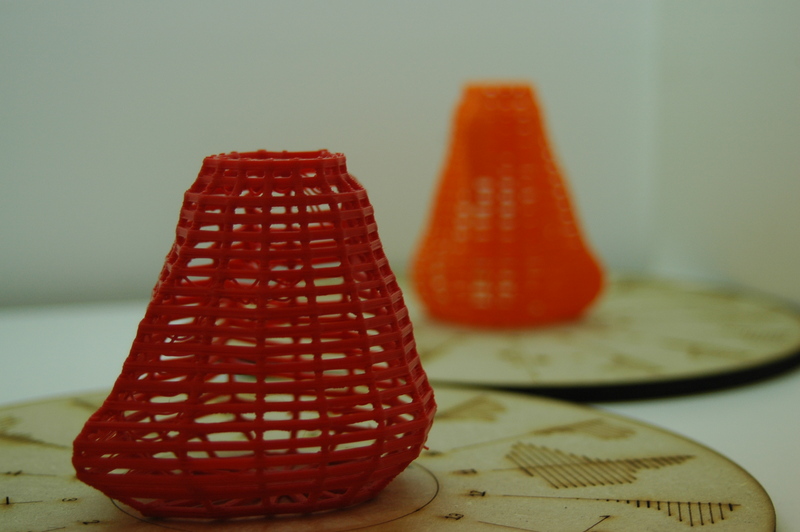 Other outstanding creations can be found in FabLab.iMAL such as Lumisokea & Legoman’s Selva. 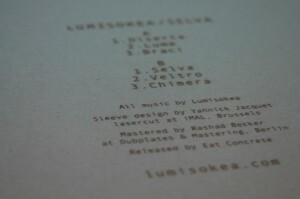 For his upcoming album, Lumisokea in collaboration with Legoman has laser cut 200 unique vinyl album cover’s sleeves. All of them are slightly different. 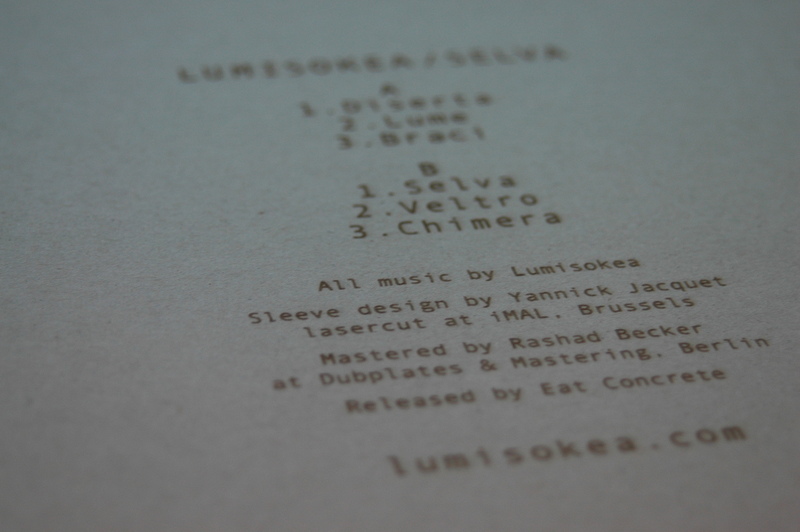 The final step was to photograph each sleeve and make a short promotional movie. Be creative and let’s fab in Brussels too!